The 2017 AWP Conference is just a couple days away. We’ll be exhibiting at table 548-T, and we’re co-hosting an off-site event on Thursday, February 9th. This year’s conference is in Washington, DC. Meanwhile, a few blocks from the convention center, a misygonistic xenophone sits in the white house. Consequently, this year’s AWP must be about more than schmoozing and afterparties. We’re a socially responsible publisher, and we typically donate copies of our print-runs to charities like Housing Works Bookstore Cafe and Open Books. At this year’s AWP Conference, we’re going a step further. We are donating 10% of all AWP sales to the American Civil Liberties Union. Just a couple weeks into the Trump presidency, and the ACLU has already challenged the Trump administration’s actions in court. The ACLU has along history of demanding equal rights and fighting for our basic feedoms, and we’re proud to offer whatever support we can. On a related note, we hope you’ll consider attending Saturday’s Candlelight Vigil for Free Speech. The vigil will take place at Lafayette Park, directly across from the White House. It is just a short walk from the convention center. The vigil starts at 6:15pm. Hand-held signs only and no large bags allowed (leave that AWP tote bag in your hotel room). Speakers include Kazim Ali, Gabrielle Bellot, Melissa Febos, Carolyn Forché, Ross Gay, Luis J. Rodriguez, and Eric Sasson. If you know of any other vigils, protests, or other political events taking place during the AWP Conference, please e-mail us with the details. At this year’s AWP conference, Melissa Reddish will be at our table signing books! Stop by table number 548-T on Friday, February 10th from 2:00pm to 3:00pm. 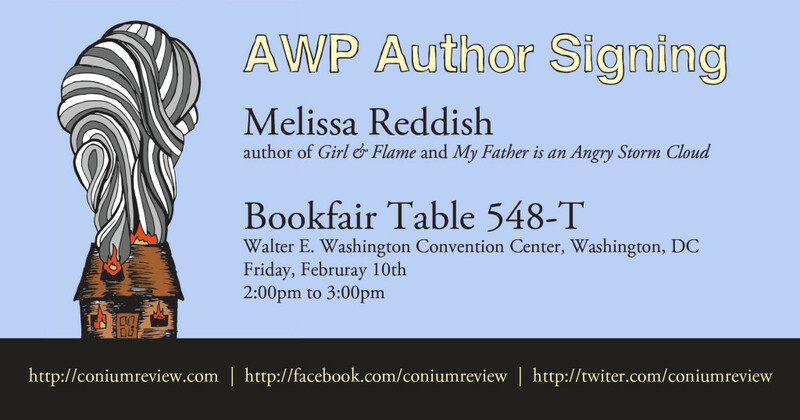 Melissa will be signing copies of her Conium Press novella, Girl & Flame. You can also catch her and other Conium Press authors at our offsite reading on Thursday, February 9th at Bar Louie. 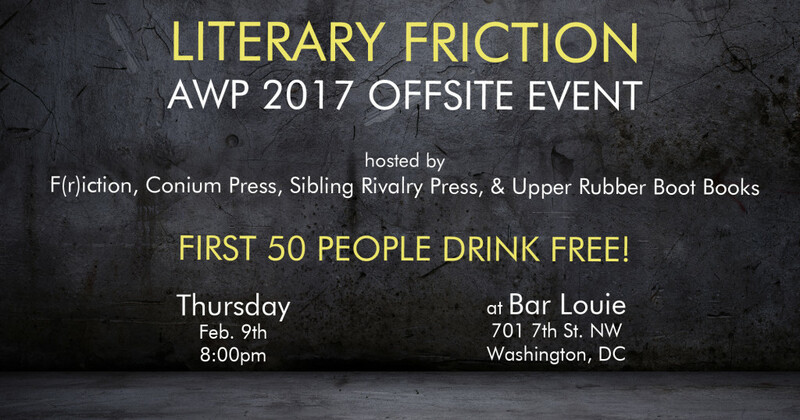 We’re pleased to be participating in an AWP 2017 offsite reading with F(r)iction, Sibling Rivalry Press, and Upper River Boot Books. The event will be at Bar Louie, located at 701 7th St NW (just a few-minute walk from the convention center). Event starts at 8:00pm. No cover charge, and the first 50 people in the door get free drink tickets. Find the event on Facebook and share it with your friends. Maryse Meijer, reading from “Her Blood,” published in The Conium Review: Vol. 5. Melissa Reddish, reading an excerpt from her novella-in-flashes, Girl & Flame, published by Conium Press in 2016. Kate Garklavs, reading her flash fiction, “In Memoriam: Lot 69097,” winner of our 2016 Flash Fiction Contest, judged by Leesa Cross-Smith. The Conium Review‘s outreach coordinator, Chelsea Werner-Jatzke, will also be reading from her Sibling Rivalry Press chapbook, Adventures in Property Management. Readers for the other presses include David Abrams, Amie Whittemore, Ben Janse, Joy Baglio, Michelle Lin, Kazumi Chin, Kai Carlson-Wee, Anders Carlson-Wee, and Geffrey Davis. We hope you can make it, and stop by The Conium Review‘s AWP bookfair table: 548-T.